Home › What is Esperanto? 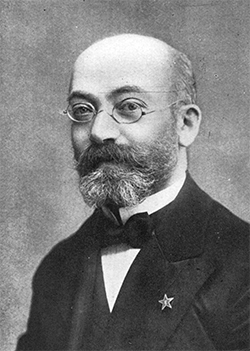 Esperanto is a planned language, developed in the late 1800s by L. L. Zamenhof. He grew up in in Bialistok, Poland, a town full of people of different nationalities who spoke different languages. He saw the mistrust and division that this lack of communication caused. His aim in developing Esperanto was to create an easy to learn, politically neutral language to allow communication between nations and to encourage peace and understanding between all peoples. Esperanto was designed to be taught to all as a second language. The simple structure and rules of Esperanto make it incredibly easy to learn (150 hours of study vs 2000 hours for German) yet also give the speaker the capability of expressing the same kind of complex thoughts available to natural languages. Based on Indo-European, Germanic, Slavic and Greek languages, Esperanto also gives students of other languages a superior foundation for learning. Ŝia esprimo de amo al mi vere kortuŝis, sed indikis nur, ke ŝi estas malsata ĉar la aliaj katoj formanĝis jam ĉion. To hear what the above phrase sounds like, click the play button below. Esperanto appears in both popular mainstream English language film and television, and also has a collection of films of its own. A few of the former include the British comedy series Red Dwarf, the science fiction film Gattaca, and Blade: Trinity, plus numerous others. There are a few films shot entirely in Esperanto, including one of debatable quality from 1966 starring William Shatner called Incubus. More recently there have been a number of documentaries such as Academy Award-nominated director Sam Green’s The Universal Language. In 2012, to celebrate 125 years of Esperanto, an Esperanto short film competition was arranged, inviting entries up to five minutes long. The diverse and entertaining results can be viewed on YouTube. An online Esperanto TV station also recently launched, and you can follow them on their Facebook page. There are also a number of films which aim to teach Esperanto; for a list of these visit our learning online page. Esperanto music is as diverse as the people who create it, and spans many genres including rock, folk, hip hop, reggae, heavy metal and more. There are also a number of traditional Esperanto songs which are sung at congresses, and nursery rhymes for children. A wide selection of Esperanto music is available from Vinilkosmo. There are over 25,000 books published in Esperanto, both translated and original works. Many of the classics can be found for free download at Project Gutenberg. The Melbourne Esperanto Association also has a rich library of books available to loan to our members. 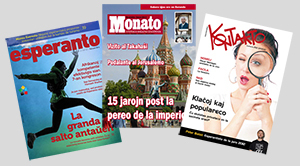 There are also numerous magazines and newsletters produced by various Esperanto organisations in Australia and internationally. Esperanto is great for travel, allowing access to friendly and helpful local Esperantists in over 80 different countries via the local Esperanto Association. Esperanto speakers are also welcome to use the “Pasporta Servo” or “Passport Service” to find free accommodation throughout the world at the homes of other Esperantists. This service is organized by TEJO, the Worldwide Esperanto Youth Group. There are many and varied Esperanto events each year throughout the world.